Observations by the Helioseismic and Magnetic Imager on NASA's Solar Dynamics Observatory show a two-level system of circulation inside the sun. Such circulation is connected to the flip of the sun's north and south magnetic poles that occurs approximately every 11 years. Using an instrument on NASA's Solar Dynamics Observatory, called the Helioseismic and Magnetic Imager, or HMI, scientists have overturned previous notions of how the sun's writhing insides move from equator to pole and back again, a key part of understanding how the dynamo works. Modeling this system also lies at the heart of improving predictions of the intensity of the next solar cycle. Using SDO, scientists see a performance of explosions and fountains on the solar surface. Shots of solar material leap into the air. Dark blemishes called sunspots grow, combine and disappear as they travel across the sun's face. Bright loops of charged particles – captured by magnetic fields dancing around the sun – hover in the atmosphere. This dynamic display is all powered by a complex, ever-changing magnetic current inside the sun known as the dynamo. This magnetic system flips approximately every 11 years, with magnetic north and magnetic south switching poles. This process is an integral part of the sun's progression toward a pinnacle of solar activity, known as solar maximum. 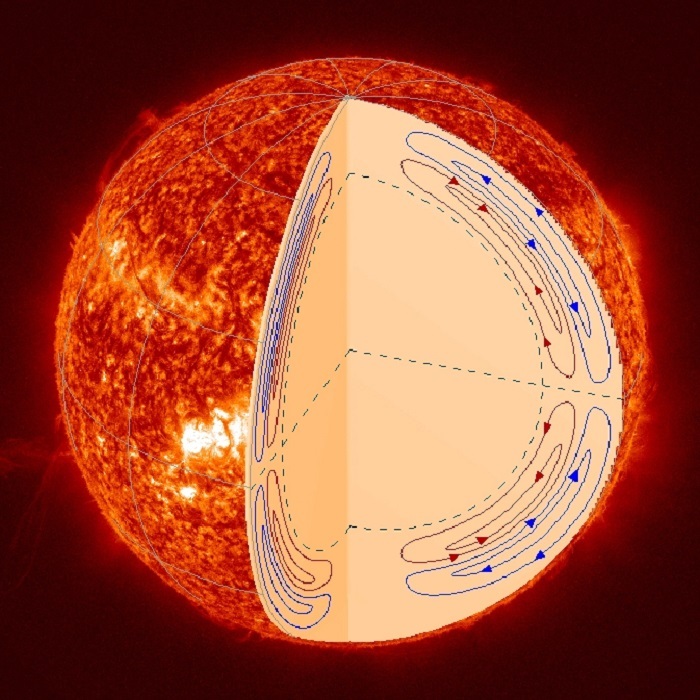 The team's recent results show that, instead of a simple cycle of flow moving toward the poles near the sun's surface and then back to the equator, the material inside the sun shows a double layer of circulation, with two such cycles on top of each other. The results appear online in the Astrophysical Journal Letters on Aug. 27, 2013. "For decades people have known that the solar cycle depends on the poleward flow or material, changing the magnetic fields from one cycle to the next," said Philip Scherrer, principal investigator for HMI at Stanford University in Stanford, Calif. "We mapped out what we believed to be the flow pattern in the 1990s, but the results didn't quite make sense." Since the mid-1990s researchers have been observing movement inside the sun using a technique called helioseismology. The technique makes use of the fact that waves course across the sun, back and forth, oscillating with an approximately five minute period. Such waves are similar to the seismic waves that spread out under the ground during an earthquake. By monitoring the oscillations seen at the surface of the sun, scientists can gather information about the material through which the waves traveled, including what the material is made of and how fast and in what direction it is moving. Such observations quickly showed scientists how material inside the sun rotates from east to west: material moves more slowly at the poles than it does at the equator. The observations also soon showed that material moved from the equators toward the poles within the top 20,000 miles of the sun's surface – but the flow back toward the equator from the poles was not detected. Early models of all this moving material, therefore, assumed that the equator-ward flow was much lower, only occurring at the bottom of the convection layer of the sun that houses these flows, some 125,000 miles down. "Scientists have used this assumption to describe the solar dynamo," said Junwei Zhao, a helioseismologist at Stanford University in Stanford, Calif., who is the first author on the paper. "And now we have found that it isn't right. The flow patterns we have found are sharply different." Zhao and his colleagues observed two years worth of data from HMI, which differs from one of the best previous helioseismology instruments – the Michelson Doppler Imager on board the joint European Space Agency/NASA mission the Solar and Heliospheric Observatory, or SOHO. SOHO observed the sun in low resolution on a regular basis, but only observed it in high resolution for a couple months each year. HMI observes the sun continuously with 16 times more detail than SOHO. Using this data, Zhao compared the helioseismology results measured at four different heights within the sun's surface, and found these results were not consistent with what the normal convention would expect. The team proposed a way to make these four sets of measurements agree with each other. This new method not only brought the four data sets into harmony, but also helped find the long-sought equatorward flow inside the sun. The team found that the flow toward the poles does indeed occur in a layer at near the sun's surface – but the equatorward flow isn't at the bottom. Instead, the material seeps back toward the equator through the middle of the convection layer. Moreover, deep down inside the layer is a second stream of material moving toward the poles, making what the scientists refer to as a double-cell system in which two oblong flow systems are stacked on top of each other. "This has important consequences for modeling the solar dynamo," said Zhao. "We hope our results on the sun's interior flow will provide a new opportunity to study the generation of solar magnetism and solar cycles." Zhao and his colleagues have provided their new map of the sun's interior to scientists who simulate the dynamo. The next steps will be to see how such new models jibe with the observations seen on the sun and how it may improve our ability to understand the constant dance of magnetism on the sun.